I am a user of Avira free for a while now, I think it is around 2 years now or around that, but i always found that popup advertising their premium version really annoying as it would happen in daily basis. I tried a lot of free antiviruses before concluding to Avira, none of them included such an annoyance. Well I know they provide a premium payed version, and I know it comes with more features than the free one but I am not interested in getting the premium version, I am completely satisfied with the free, and I really see no reason to get reminded every single day that they offer a premium service. So after a little bit of search I realized that it is possible to stop the annoying popup from appearing. So after a quick search on Google, I reached this post at wikiHow.com. This article explains how to prevent the popup from appearing. This will not affect any other part of the antivirus and the updates will work just fine. So for my OS, Windows 7 Ultimate (this guide applies also to Windows Vista Business and Ultimate) you have to go through the following steps. Go to Administrative Tools (If “View by:Large Icons/Small Icons” is selected. If “View by: Category” is selected then go to System and Security and then chose Administrative Tools. ), there choose to open Local Security Policy/ies. And that’s it you have blocked the annoying popup for life (well actually more like till next format or till you remove it). For other versions of Windows you can visit the original post at wikiHow.com. While I was bored playing around with StumbleUpon, I found an interesting article on groovyPost.com about how to change your logon background on windows 7. It’s rather interesting, because after a while I somehow did get bored of the default windows 7 Logon screen background, though I have to admit that I only see it a few times every few days when I reboot my PC, but still a change would actually be welcome. In the beginning I decided to re-post the howto guide on my blog linking to the site, and also to the specific post I was re-posting (Links have been removed since the last edit). Apparently the owner of the site didn’t actually like my re-posting of his work so he send me a request to remove the re-posted content. Well I can not judge him for wanting the guides/howtos he made only posted on his site for whatever reason (the reason he gave me was about the time he spend in gathering/creating the howtos and guides and maintaining his website, well I can’t argue with that and I can understand his point on this, and that’s why usually when I re-post something I mention my source), that’s his right. So I complied with his request and completely removed the re-posted howto. Probably it is my fault for re-posting content without checking the site for any guidelines on this subject or sending a mail to ask if I can actually do something like this. However the info provided in his guide are generally part of a lot of guides, some of them dating back to the period of the Release Candidate versions back in the spring/summer of 2009. On of the most popular guides is the one at withinwindows.com by Rafael. Since the steps are pretty simple I’ll present the info here in my own way based on the info supplied by the post linked above. You have to start the regedit application. For this you have to open the Start Menu, go to the search box and type “regedit”. 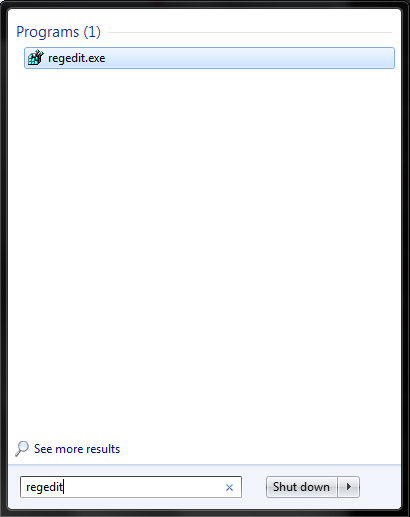 Regedit.exe should appear on your results. Click on it to open the regedit. key. 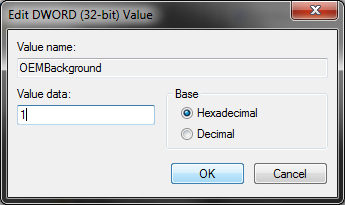 There you have to check for a DWORD(32-bit) value with name OEMBackground. OEMBackground gets boolean values of 0 (disabled) and 1 (enabled). Then you double click on the Key to change the value from 0 to 1. According to the various guides there is a possibility that this value will be nonexistent, which means that you will have to create it. The images are stored in %windir%\system32\oobe\info\backgrounds. Paste that to the address bar of the windows explorer and press enter to open the folder. 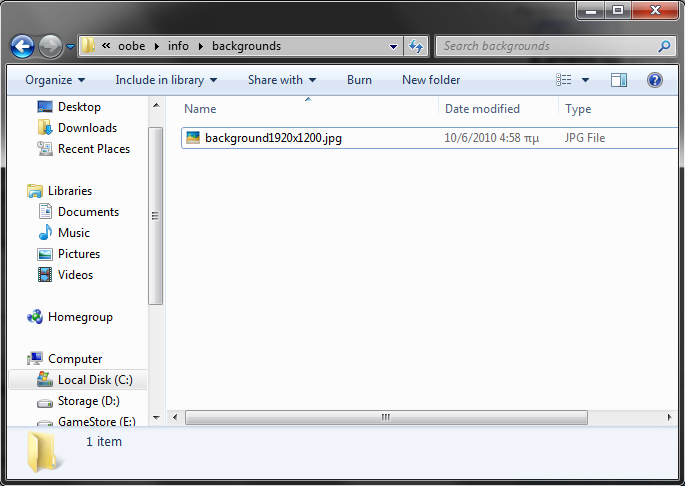 In some systems this folder might not exist so you go to %windir%\system32\oobe\ create a new folder created info and inside that another one named backgrounds. The image must be placed inside the %windir%\system32\oobe\info\backgrounds.The images file size can’t be larger than 256KB. It seems according to that post that the backgroundDefault.jpg image is actually stretched to fit to the screen when a resolution/ratio specific isn’t found. So my best guess is that if you want a non stretched image better add one in your monitors resolution. I am sure it will actually look better that a stretched one. 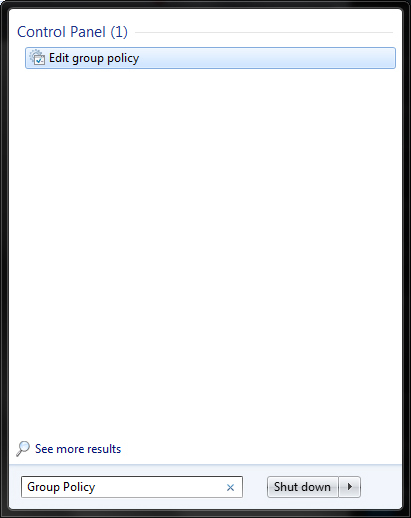 I also found that another way to do this is through the Group Policy Editor. 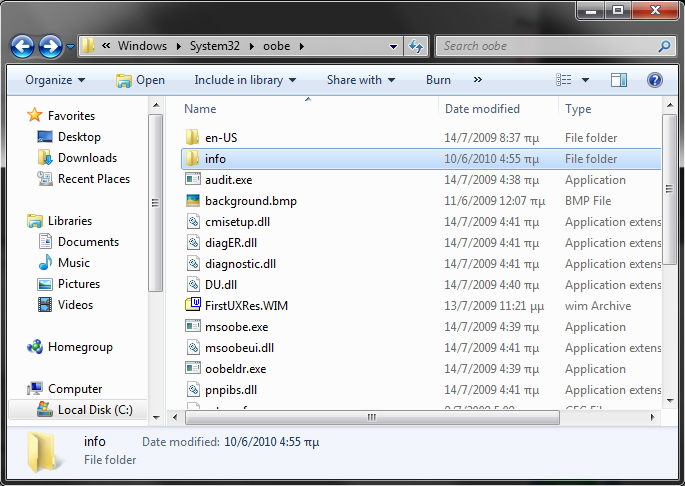 Though I am not really sure if it works with every Windows 7 or just with Ultimate. 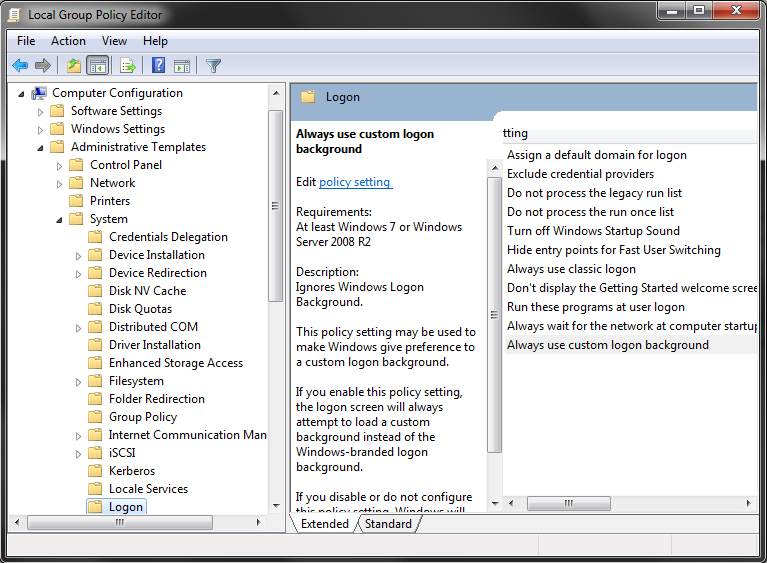 So to change the logon screen background this way you have to go to the Start Menu and type Group Policy on the search box then click on Edit Group Policy. After opening the editor navigate to Computer Configuration -> Administrative Templates -> System -> Logon. 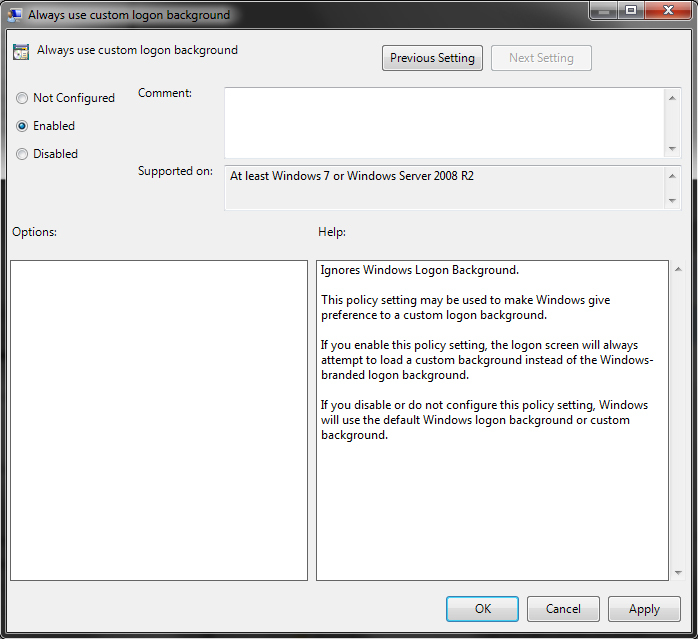 Then double click on Always use custom logon background and set it to enable, by default it is set to not configured. After this part you can go up to the folder creation part (if the folders don’t exist) save the image in he folder with the proper name as mentioned above etc. Both the ways mentioned in the above might actually be hard for the inexperienced people. However there is also another way, which is easier. 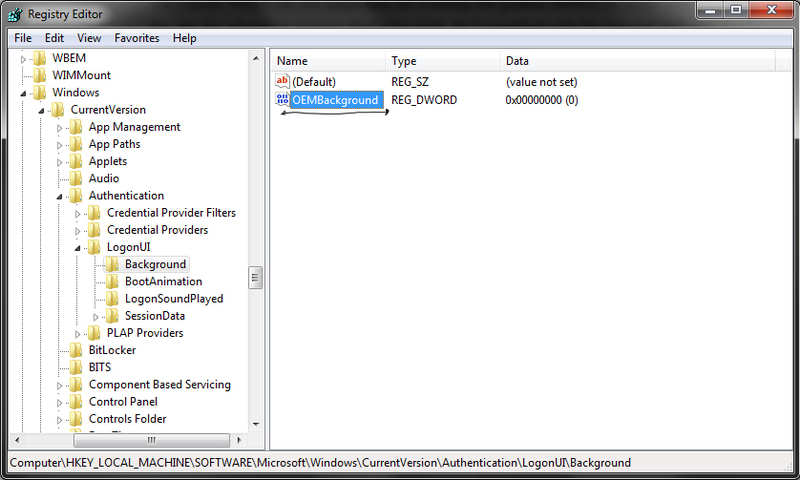 You can achieve the same results with the use of a free application called Logon Changer For Windows 7 by tweaks.com. This option is a nice solution for the non tech-savvy people, as it is really easy compared to the other solutions.